The history of Cambodia began in the first century A.D with the establishment of a State called Funan. Funan is still renowned as being the oldest Indianized State in the whole of Southeast Asia. Modern day Khmer customs and language evolved from this period in time. Sanskrit, which is part of the Mon Khmer family dialect, was the written and spoken language of that time. The officially known religion began with Hinduism, which over the years evolved into Buddhism. Distinct characteristics of that period still remain today. These features can be recognized in ancient buildings, and ancient farming methods, as well as country clothing. The State of Funan was situated in what is known today as the southern province of and lasted for a period of 600 years. This dynasty gave way to the powerful Angkor Empire that was eventually responsible for establishing the Khmer Kingdom, as we know it today. The following generation of powerful kings that belonged to the Angkorian dynasty are believed to have come from India and Javanese part of today's Indonesia. The dynasty reigned for a period of 650 years, and their empire covered much of South East Asia, as we know it today. Their territory stretched from Burma, which lies east, to the South China Sea and further north, right up to Laos. Khmer kings, during this golden period of rule, built the most ornate and extensive temples or prasats known to mankind. These spectacular constructions were built throughout the kingdom, Angkor Wat, is of course the most famous. 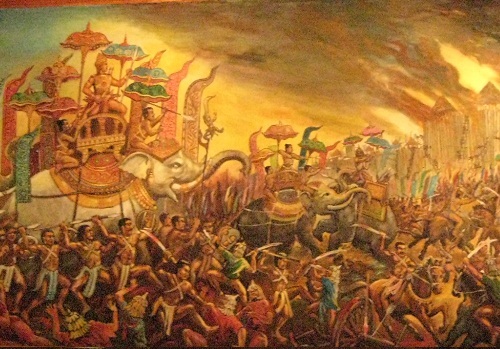 Amongst the most successful of the Angkorean kings was Preah Bat Jaya Varman II, Preah Bat Indra Varman I, Preah Bat Surya VarmanII, and Preah Bat Jaya Varman VII. Besides building the most majestic monuments on earth, they were also responsible for huge agricultural feats of engineering which included sophisticated irrigation systems, great water reservoirs, and countless canal systems that guaranteed food transport. Some of these systems are still in use even today. Angkor became the capital of a great kingdom and the centre for government, education, religion, and commerce. However, in the late 13th century a sudden shift of power took place. Angkor was invaded and eventually, completely ravaged. Mankind’s most predominant creation on earth was plunged into total destruction. The entire population and wealth of a once proud civilization was abandoned and covered by tropical forest. Following the abandonment of Angkor, Cambodia's capital population migrated south to Long Vek, then further to Ou Dong, and eventually to Phnom Penh. The destruction of the mighty Angkorian capital also caused a decline, adaptation, and eventual replacement of Hinduism. Theravada Buddhism became the national religion. From the 15th century to the 17th century, Cambodia often found itself encroached by neighboring Thai and Vietnamese forces. They resisted, but eventually succumbed to a European colonial power. In 1863, Preah Bat Norodom signed a Protectorate Treaty which France, which consequently placed Cambodia under French rule for the next 90 years. After the death of Preah Bat Norodom in 1904, Preah Bat Sisowath, cousin to King Norodom, was subsequently crowned as the new king of Cambodia. However, the throne returned to the Norodom family with the following coronation of Preah Bat Norodom Sihanouk, our current monarch, in 1941. At that time he was only 18 years old. Shortly after that, during the Second World War in 1945, the Japanese ousted the French. King Norodom Sihanouk took the opportunity to free Cambodia from foreign control. For many years following, His majesty campaigned tirelessly for this objective, and was eventually rewarded. Cambodian was granted its independence in 1953. The Independence ceremony marked the end of 90 years of French protectorate rule. In 1959, King Norodom Sihanouk abdicated the throne, turning the position of Kingship over to his father, Preah Bat Norodom Soramarith. Then, Prince Norodom Sihanouk, became the Head of State and ruled the government. From 1950 through to 1970, the Kingdom of Cambodia was self-sufficient and prosperous. It excelled in many areas of development. Cambodia was then known as the jewel of the Orient. Unfortunately the prosperity was very short lived. As war started to escalate in Vietnam, Cambodia's borders increasingly became the targets of American and Vietnamese aggression. On March 18th, 1970, General Lon Nol, backed by the Americans, overthrew the Head of State Prince Norodom Sihanouk. Consequently, Cambodia became deeply involved in the war, fighting mainly against the Khmer Rouge fighting faction, Lon Nol's control over Cambodia's government lasted for a period of barely five years, being eventually overthrown by the Khmer Rouge, headed by Pol Pot on the 17th of April 1975. History repeated itself once again as soon as Pol Pot invaded. The entire population evacuated the city leaving a once vibrant capital in ruin and decay. After the evacuation, The Khmer Rouge tricked Prince Norodom Sihanouk in to returning to Phnom Penh to be Head of State, but he was not allowed to Phnom Penh to be Head of State, but he was not allowed to leave the Palace walls-in effect he was placed under house arrest. 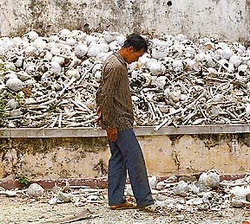 The Khmer Rouge then proceeded to implement a “reign of terror” on Cambodia's entire population. People were brutally forced to work as slaves in the rice fields. These people had to endure long periods of hard, painful labor while effectively being starved at the same time. Pol Pot's Kampuchean force labor camps tortured, killed or starved to death an estimated 2 million people, including women and children who they savagely put to death indiscriminately. In1989, the Vietnamese withdrew from Cambodia and the country was re-named "State of Cambodia." In 1991, a Paris Peace Accord created the United Nations Transitional Authority (UNTAC) which was backed by some 22,000 United Nations troops to prepare the first, free and fair general election. In May 1993 UNTAC supervised Cambodia's first general election. Preah Bat Norodom Sihanouk Was subsequently re-instated as King. A second general election was held in July 1998. Today, the Kingdom of Cambodia is once again a peaceful place to visit. It is, at present, in the process of getting rebuilt. Cambodia now incorporates a Constitutional Monarchy State with His Majesty Norodom Sihanouk effectively remains the symbol of national unity for the people of Cambodia who hold him dear to their hearts.